STATEN ISLAND, N.Y. – June Baird Perrella, 89, of Westerleigh, died Friday in Staten Island University Hospital. She was pre-deceased by her husband of sixty-five years, Angelo Perrella, who died in December 2012. A native Staten Island, Mrs. Perrella, graduated with high honors from Port Richmond High School in 1946. Mrs. Perrella was a homemaker and mother of six children. She was past president of the Saint Anne’s Guild of St. Roch’s R.C. Church in Port Richmond and was also past president of the Mckee High School PTS. Mrs. Perrella was a longtime fundraiser and volunteer for the senior group at the YMCA, West Brighton and was honored for her volunteer services at Eger Nursing Home. 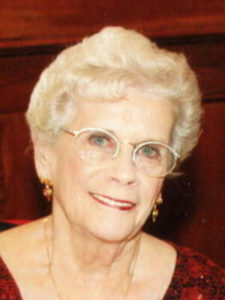 Her hobbies included going to the gym, knitting, traveling and spending time with family. June and her husband, Angelo, visited London, Paris, Bavaria, Austria, Venice and Canada. She was an avid reader and had an adventurous spirit, as shown by her several hot air balloon rides, bi-plane ride, sail plane, zip-lining, motorcycle riding and her six gold and silver medals won in the YMCA Beatrice Victor Senior Olympics. She was well known for her crocheting skills. In addition to crocheting blankets and sweaters for family members, she made many items that were donated to charitable causes. She is survived by five sons, Michael, Richard, Timothy, Peter and Lee; a daughter, Susan Nigro; six grandchildren and five great-grandchildren. Funeral from Cherubini McInerney Funeral Home, 1289 Forest Avenue PR on Thursday, 9:15am. Mass of Christian burial at St. Roch’s 10am. Interment St. Peter’s Cemetery. Friends will be received Wednesday, 2-4 and 7-9pm. In Lieu of flowers, please make a donation in June’s memory to YMCA, 651 Broadway, Staten Island, New York 10301, Attn: Heather Scapp. to be serene and graceful as well as a really good Mom. In you hearts. She wil be missed by so many …. Thank you Peggy, it is GreTly appreciated. Our condolences all. I didn’t get to know Jack’s Aunt June until later in life, not too long before Uncle Sonny passed. We spent an afternoon with them at their house with our kids Alex and Andrea. Alex wanted to meet his Grandpa’s only living brother and hear stories of his Grandpa Carmine. It was then that I learned of the remarkable woman Aunt June was! A women ahead of her time, to be sure!! We were all in awe hearing stories of her flying planes and, I think, skydiving?! She must have been one terrific mom and GREAT Nona!!! RIP Aunt June. You had a full and impactful life. We are so sorry for your loss. Our thoughts and prayers will be with you all. My sincere condolences to all. What an incredible journey June had. God bless your entire family. I know you all will have wonderful memories of her to sustain you. I am the youngest cousin, but always looked forward to seeing her smile. My sympathies are with your family.